PBR - Fielding has never been one of Domonic Brown's strong suits and last night proved yet again he's still learning how to play outfield at the major league level. 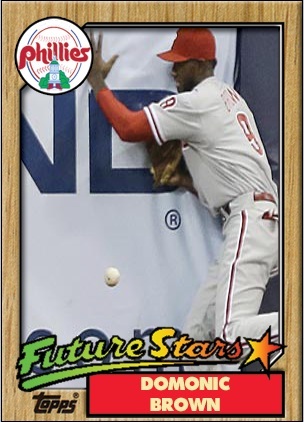 A towering fly to right field last night by Nyjer Morgan glanced off the pocket of Brown's glove, allowing the Brewers to put together a string of four runs en route to a 6-2 win over the Phillies. "I got back there good. I just dropped it," Brown said. "That play has to be made. Simple as that. I needed to come up big for my team and it didn't happen. No excuses. I've got to make that catch." Brown has not yet officially committed an error but he has made several fielding gaffes since his call-up at last month's trade deadline. He's athletic but awkward and prone to taking poor routes to balls hit to the outfield. How many more games will it take to get comfortable? Through three partial seasons in the majors Brown has played the outfield in 83 games and has a fielding percentage of .966. The league average fielding percentage for outfielders is .986. Also, according to the folks at Baseball Information Solutions and their Defensive Runs Saved Above Average metric, his defensive skills have cost the Phillies 22 runs over the past three years. This means his defense has cost the Phillies a run in more than a quarter of the games he's played in. Brown's minor league fielding numbers are even more troubling, highlighted by 44 errors and a .956 fielding percentage.